We describe some of the issues - both philosophical and technical - involved in the evolution of computer software used for the design and realization of aesthetically appealing symmetric patterns. We illustrate how the choice of algorithm can dramatically affect the final design. The images shown in this paper1 were all designed and constructed using a software package called prism (an acronym for PRograms for the Interactive Study of Maps) that I started to develop about eleven years ago. 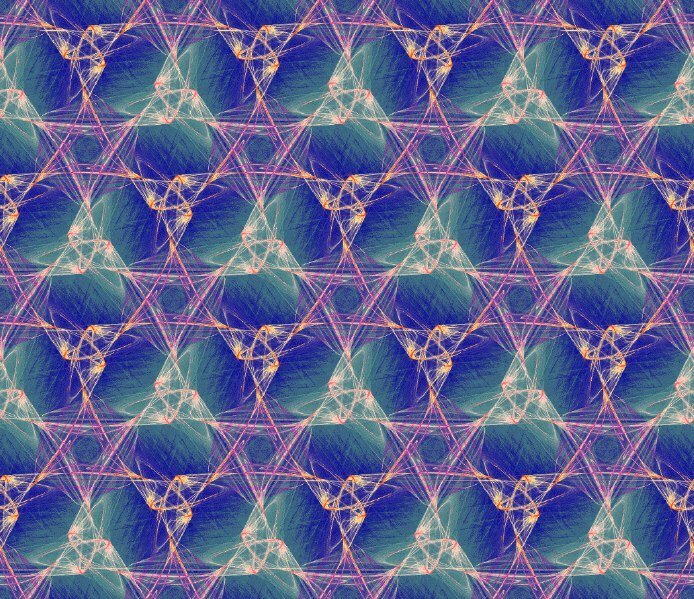 In recent years I have used prism as the basis for a course on `Patterns, Designs and Symmetry' that I teach to Junior/Senior level art students at the University of Houston, and also in a seminar for teachers held under the auspices of the Houston Teachers Institute. These teaching experiences, and the possibilities for using this computer software in the classroom, are described in more detail in [4,5]. Although working with prism in a teaching situation has often provided a strong stimulus to make the interface more user friendly, the main impetus for developing prism has always been my personal interest in finding new and effective ways to design, color and realize attractive symmetric patterns. In this article, I want to share some speculations and experiences generated by recent attempts to produce `art' from silicon and chaos. 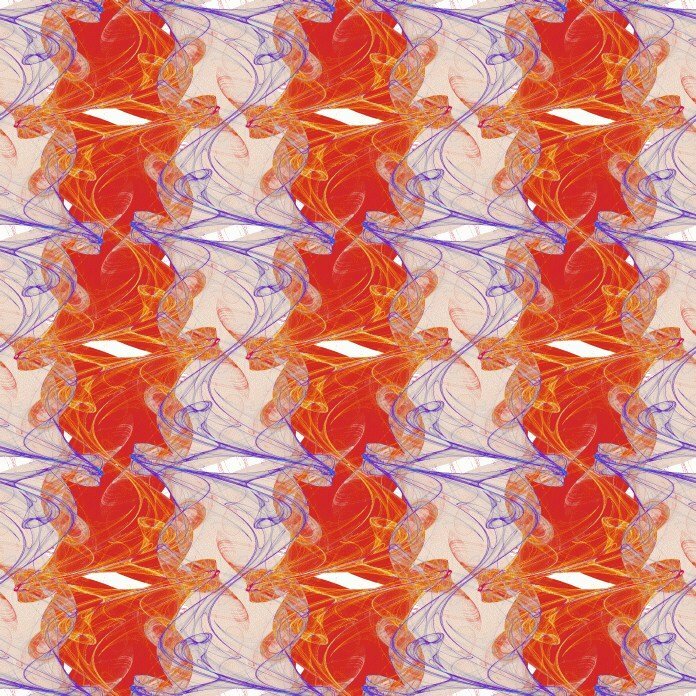 All of the images that are shown result from an ongoing project to develop a library of algorithms for the design and artistic realization of the one- and two-color wallpaper patterns. Throughout, we shall follow the standard notational conventions for wallpaper patterns as described, for example, in Washburn and Crowe . We refer to [1,7] for general background on symmetry and the use of methods from chaos and dynamical systems in design. For 2-color designs, see [1,2,6]. Many colored images can be found at the URL: nothung.math.uh.edu/~mike/. The references [8,9] provide an excellent source of many examples of symmetric designs and patterns from many cultures and eras. 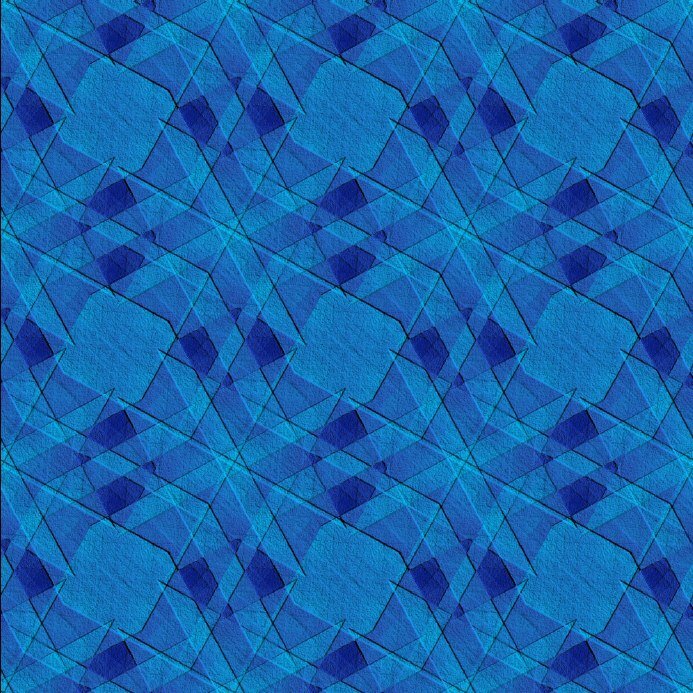 In Figure 1, we show a characteristic wallpaper pattern designed using prism . I feel that the development of the program that led to the creation of this image as an integral part of the creative process. That is, the mathematical algorithms, the computer program, and the design and reproduction (realization) of the images are just different facets of the same underlying process. In this regard, I am not so interested in creating pictures using a generic graphics software package. For me, the process of creation and design involves developing the tools and techniques in parallel with their application. Indeed, the development of these tools is largely governed by the character of the image I want to design and the way in which I want to realize the final image (for example, on photographic paper). Of course, sculptors and artists have always developed their own technology - whether it be pigments or the engineering and machining of contemporary sculpture. In spite of the apparent demise of the Renaissance man and the increasing compartmentalization of knowledge, I believe a creative artist - or scientist - cannot be detached from the tools with which he works. Sometimes, he or she needs to be an engineer or computer programmer. In the following sections, we show some of effects that we can achieve with different types of algorithm. Partly for reasons of space, we avoid any detailed description of the explicit mathematical form of the algorithm (but see [4,7]). Let us start with a hypothetical situation. Suppose that a designer wants to create a wallpaper pattern based on lions. What type of algorithm should be used? Is it possible to design a `lion algorithm' that will reliably produce `lion-like' images and which can be adjusted to vary the shape and textures of the lion? What type of symmetry should the designer use to convey, for example, a sense of motion or speed? In one sense it is relatively straightforward to implement a lion algorithm. Take a scanned image of a lion and symmetrize over the appropriate symmetry group. 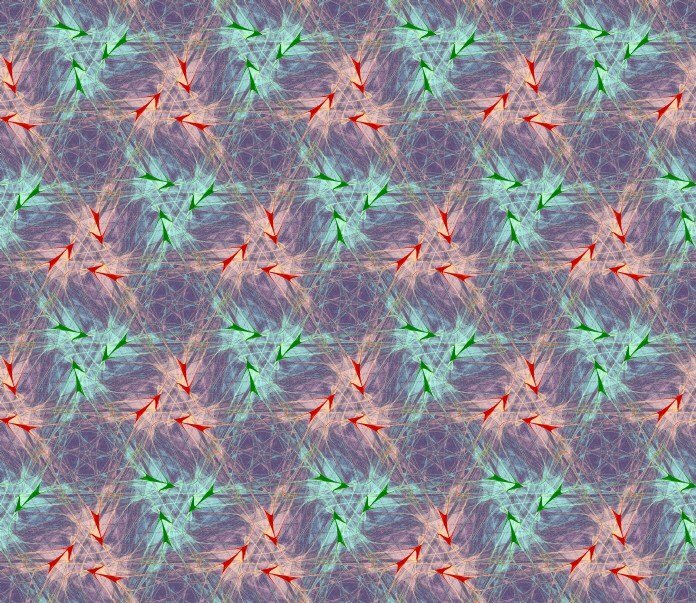 This is the kaleidoscopic method employed so effectively in Kevin Lee's KaleidoMania! program. However, symmetric images produced by symmetrization techniques typically lack global coherence. More precisely, the process of symmetrization typically introduces discontinuities in the image - unless one avoid overlaps (see ). This, of course, is not a criticism of the kaleidoscopic method. Rather, it an observation that to create artistically satisfying images one needs more than a kaleidescope. Although our approach has not yet led to a simple recipe for producing a `lion algorithm', one class of algorithms we have experimented with can lead to images with a pronounced naturalistic flavor. In Figure 2 we show one such pattern that would resonate with any visitor to the Australian outback. 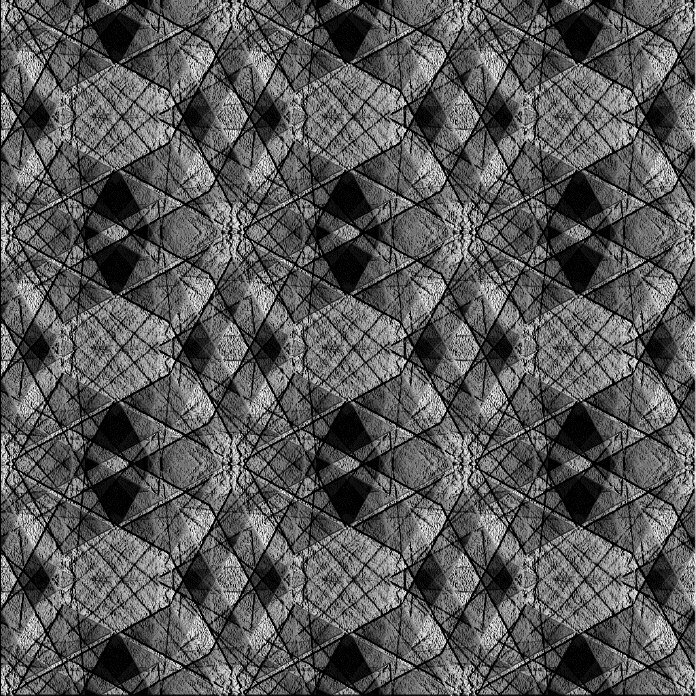 The quilt shown in Figure 2 is a wallpaper pattern of type cm and was constructed using ideas based on iterated function systems. In particular, the algorithm used was non-deterministic. 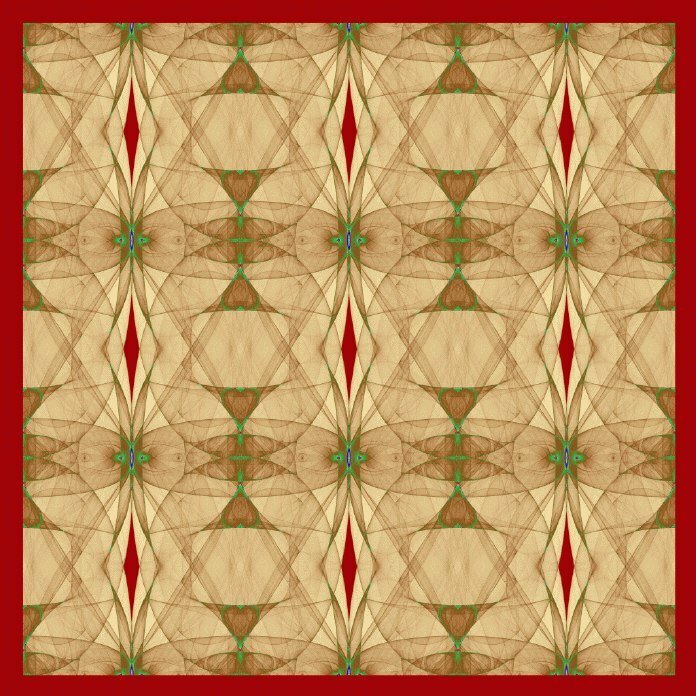 The choice of symmetry cm is apposite as this pattern has just one direction of symmetry. We might also have used the symmetry pm - then the flies would have lined up wing-tip to wing-tip. The generating function used was a polynomial map in two variables. By making small changes in the coefficients of the generating function, it is easy to make incremental changes in the shape of the flies. We show one possible evolutionary sequence in Figure 3. 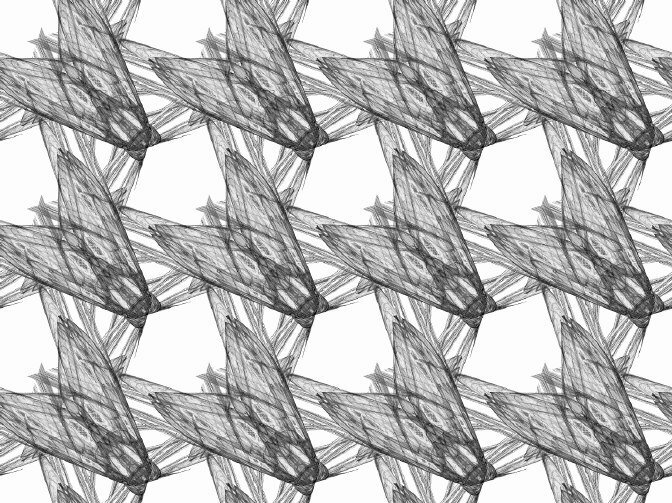 In another direction, we have developed algorithms that can generate abstract angular patterns. In Figure 4, we show two examples of these patterns. The pattern on the left is of type p4, that on the right of type pmm. Both patterns were produced using a non-deterministic algorithm and used the same continuous piecewise linear generating function. However, when we attempt to color this type of image, we find that there are drawbacks to using a non-deterministic algorithm. The reason for this is somewhat technical to explain but is related to the fact that the associated invariant measures (see ) are often rather uniform. This can make effective coloring quite difficult2. This problem is less severe when we use a deterministic algorithm. Initial investigations of piecewise linear deterministic algorithms with symmetry p4m have resulted in a number of quite promising angular designs and we hope to report on these elsewhere. Although non-deterministic algorithms we have experimented with often produce images with a lack of fine detail or edge data, they can yield images with rich textures. 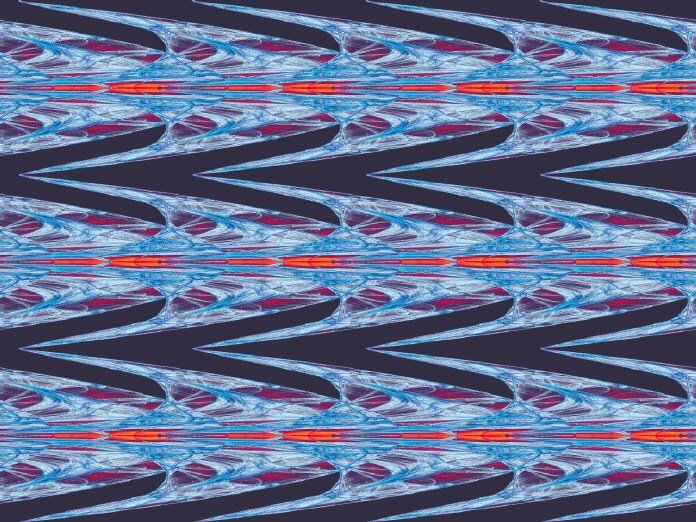 In Figure 5, we show an example of a 2-color wallpaper pattern of type p'cgg produced using a non-deterministic algorithm. 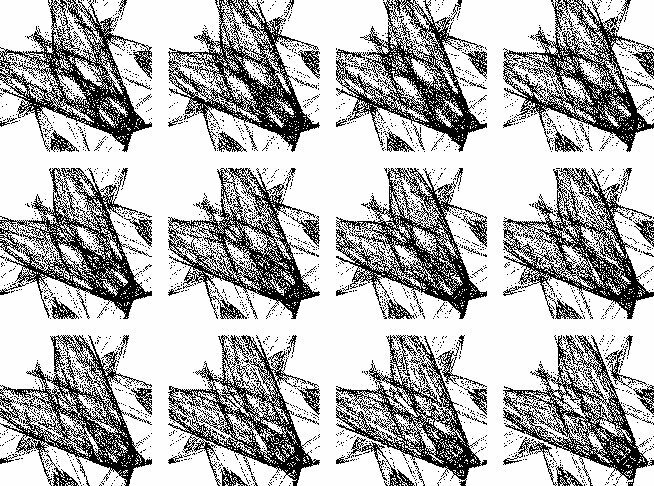 Although it is relatively easy to construct quilt patterns using methods based on iterated function systems, there is no doubt that the most aesthetically pleasing patterns are generated using deterministic algorithms associated to (trigonometric) polynomial mappings. In part this is because deterministic algorithms of this type generally lead to images with sharply defined edges. In addition, there is usually an abundance of fine structure in the image - often highly localized. Experimentation with the algorithm, symmetry and coloring, leads to a symmetrically related set of curves associated to the singular set of the mapping. In Figure 6 we shown an image of type pm that was constructed using a deterministic algorithm. The symmetry type pm is well adapted to giving a sense of direction and motion to the image - in this case from left to right. In Figure 7, we show a deterministic quilt pattern of type cmm. The design of wallpaper patterns offers additional challenges. It is well known that some symmetry types seem much more attractive than others. Further, there appears to be a cultural bias in our response to symmetry. (We refer the reader to  for a more extensive discussion of cultural and psychological responses to different types of symmetry.) In Western culture, designs with symmetry p4m (square tiling) or p6m (hexagonal tiling) are ubiquitous. On the other hand, patterns of type pgg are rather rare. One can speculate that it is the absence of reflection symmetry in pgg patterns that is responsible for their lack of appeal. However, patterns of type pg - also without reflection symmetry - are quite common. Generally, we have been somewhat unsuccessful in designing attractive patterns of type pgg using non-deterministic algorithms. We have had more success using deterministic algorithms - indeed, the search for algorithms that would yield appealing versions of patterns of type pgg was one of the reasons for our implementation of deterministic algorithms for all the 1- and 2-color quilt patterns. In Figure 8, we show an example of a two-color quilt pattern of type pg'g' designed using a deterministic algorithm. In Figures 9 we show an example of a 2-color quilt of type p6' constructed using a deterministic algorithm. 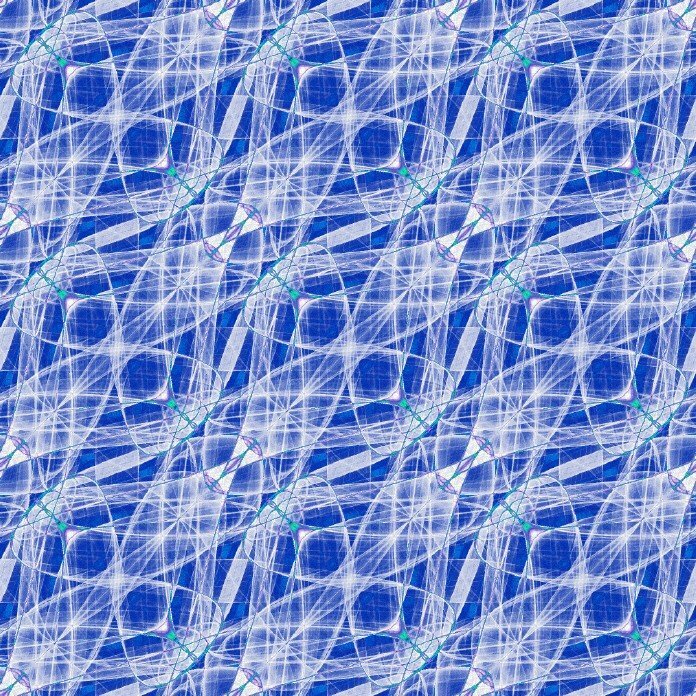 Our last picture is of a wallpaper pattern of type pmm constructed using a deterministic algorithm. The printed version of this image was exhibited in Granada as part of The Frontier between Art and Science, International Exhibition. Perhaps the main criticism levelled against those who create art using computer graphics or other modern technology is that somehow what is done is not art. My own view is that creative artists are often innovative engineers who develop their chosen medium (I do not claim the converse). Thinking about computer graphics and art in this way leads to many intriguing and challenging problems. In art, technology and science. Plus ça change, c'est le même chose. M. J. Field, `Harmony and Chromatics of Chaos', In: Bridges, Mathematical Connections in Art, Music, and Science, Proc. of the 1999 Bridges Conference (Ed Reza Sarhangi, Southwestern College, Kansas). M. J. Field, Color Symmetries in Chaotic Quilt Patterns, In: Proc. ISAMA 99, (Eds. N Friedman, J Barrallo), San Sebastian, Spain, 1999. M. J. Field, The Art and Science of Symmetric Design, In: Bridges, Mathematical Connections in Art, Music, and Science, Proc. of the 2000 Bridges Conference (Ed Reza Sarhangi, Southwestern College, Kansas, 2000). M. J. Field, Designer Chaos, J. Computer Aided Design, to appear. M. J. Field, Mathematics through Art - Art through Mathematics, Proc. MOSAIC 2000, to appear. M. J. 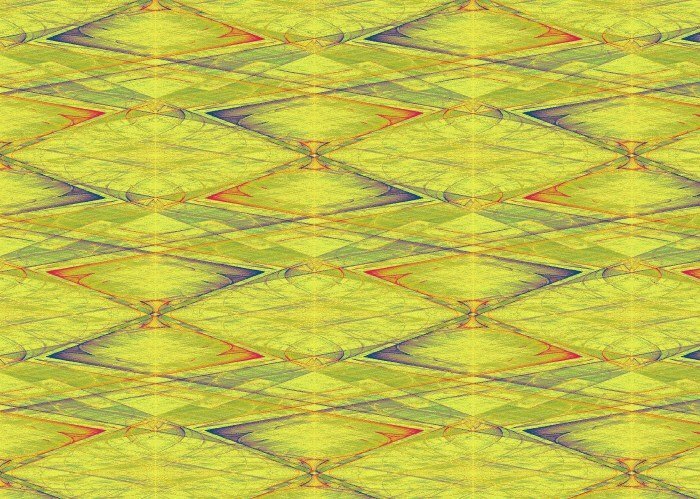 Field, The Design of 2-Colour Wallpaper Patterns Using Methods Based on Chaotic Dynamics and Symmetry , in preparation. M. J. Field and M. Golubitsky, Symmetry in Chaos, (Oxford University Press, New York and London, 1992). S. Jablan, Theory of Symmetry and Ornament , Mathematical Institute, Beograd, 1995, (http://www.emis.de/monographs/jablan/index.html). D. Washburn and D. Crowe. Symmetries of Culture, (University of Washington Press, Seattle, 1988). 1 The original version of this article was prepared for, and appeared in, the proceedings of the Bridges 2000 meeting . As images were restricted to greyscale, the emphasis in the article was on algorithms for one -color designs rather than on coloring algorithms for 2-color designs. This version of this article was specially prepared for the on-line journal VisMath and includes colored images, including two-color designs. 2 In this case we have given the images a `3D' effect using the embossing option of the gimp software package.